so much emphasis put on music in the film, did this add any pressure on you creating the score? I wouldn’t say it added any extra pressure but there is always that feeling of uncertainty and excitement when you start on any new project. When we began talking about music for the film one of the first things that came up was if we should incorporate the banjo and a bluegrass feel into the score. Ultimately the director wanted to reserve the banjo sound for Emile's character and have the score be more of an indie, garage rock, retro blues bandy type of score. We wanted to do a sort of updated sound that you might have heard in some of the buddy comedies from the 80s that had more of a down and dirty bluesy feel. -Did you help Emile out with learning how to play the banjo or give him any pointers? Production actually got him a private teacher since learning how to play the banjo is so specific. He got pretty good and ended up playing a lot of stuff live on camera for the film. 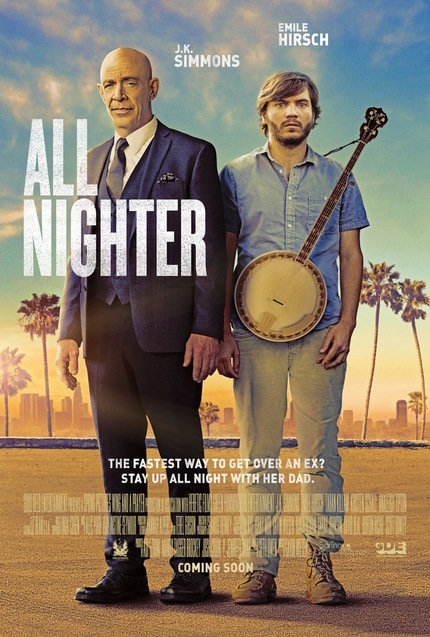 -You also scored Gavin Wiesen's first film “The Art of Getting By.” Were there any big differences in scoring that film as opposed to “All Nighter", besides the genres? The main difference in scoring “All Nighter” as opposed to “The Art of Getting By” was we really honed in on a sound right away for “The Art of Getting By” and on “All Nighter” we ended up trying a lot of different things before we ultimately landed on what was working best for the film. With “All Nighter” we had a bit more time as well which afforded us the opportunity to try various sound palettes and themes. -In one sentence how would you describe your score for “All Nighter”? It’s kind of a throwback comedic thriller type score ala “Lethal Weapon”, “48hrs”, “Midnight Run” with an indie, garage rock, retro blues band sounding feel. film, as the two main characters are on a mission to find someone. Did you realize the magnitude of how important the score would be before starting? If not, when did it hit you. Yes, 100%! On this score more than others I’ve composed the pace and drive was so important. Once Gallo (J.K. Simmons) shows up at Martin’s (Emile Hirsch) house and they proceed to go out and start looking for Gallo’s daughter Ginnie (Analeigh Tipton) the forward momentum of the film kicks off and we don’t stop moving until they find her. It was a lot of fun because the root of the score ended up being super percussive to give it that drive so I got to play drums on all of the cues which I don’t always get to do. -Are love or fight scenes easier for you to score? And why? Love scenes are definitely easier to score than fight scenes. When you score a fight scene there are so many specific beats you need to hit to amplify each moment so it takes a little longer to map it out to hit all the different nuances. different viewpoint of your craft? Definitely! The most important thing to me when it comes to scoring is supporting the story with the right compositions and themes. She is really great at breaking down a scene or a character which has given me a deeper understanding of story and is super helpful. -What type of film would you like to score next? It would be fun to score a really dark psychological thriller. The past few films I’ve scored have been more in the comedy realm so it’s always fun to mix it up. You can learn more to Alec at www.alecpuro.com.